Four years into the Iraq war and with no end in sight, music as social critique has never seemed so relevant. Here is a vital list of some of the best reactionary music to emerge from hardship, injustice, and war. Just so you know, we’re on the good side with y’all. We do not want this war, this violence, and we’re ashamed that the President of the United States is from Texas. Natalie Maines. These words were all it took to launch former country darlings The Dixie Chicks, into a sweltering cauldron of public disapproval, hate mail, and even death threats. Pan to four years later and public approval ratings of the President have hit an all-time low, suggesting a much different social atmosphere where Maines is no longer the outspoken heathen as portrayed by the media years before. But the Chicks still got their chance to shoot back with their seething 2006 single, Not Ready To Make Nice. With lyrics like, How in the world can the words that I said/ Send somebody so over the edge/ That they’d write me a letter sayin’ that ‘d better shut up and sing/Or my life will be over, the Chicks try to comprehend the blind anger of pro-Bush extremists. Marley offers the sage advice that peace in our time can be found within. In an unfortunate turn of events, this solo acoustic performance was to be the final track of Bob Marley & The Wailers’ final album, 1980′s Uprising. Bob Marley died of cancer on May 11, 1981 at the age of 36. His final words to his son Ziggy were, money can’t buy life. Four years into the Iraq war and wi th no end in sight, music as social critique has never seemed so relevant. 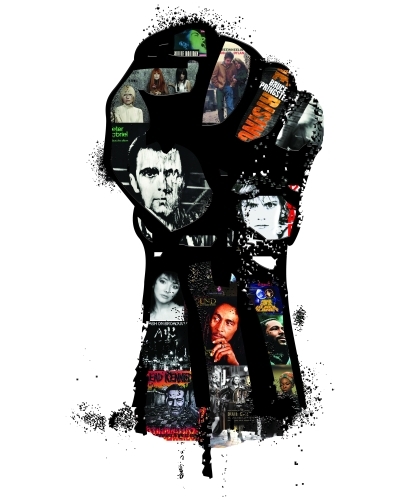 Here is a vital list of some of the best reactionary music to emerge from hardship, injustice, and war. Acerbic, humorous, and startling, Holiday in Cambodia depicts an American upper class young man getting drafted to Vietnam. Here, lead singer and lyricist Jello Biafra paints an acid-tongued account of a young man going from American decadence to Eastern totalitarianism with: And you know you’ve seen it all/In daddy’s car thinkin’ you’ll go far ¦ Well you’ll work harder/With a gun in your back/For a bowl of rice a day. A potent and oddly poetic antiwar message from the perspective of a parent who has lost her child, Kate Bush is never one to fuss with overtly political slogans and sayings. She goes right for the jugular here, telling the story of a mammy’s hero being brought home from the war in a tin box. A mother grieves over the loss of her son and questions her decision on llowing him to join the army in the first place. In this seven-minute anti-nuclear war anthem, Dylan challenges his listeners with a surrealistic account of life after the atomic bomb. In true Dylan fashion, this song made its debut shortly before the Cuban Missile Crisis. One of the first songs released through Motown to make a direct political statement; What’s Going On, was also one of Gaye’s first forays into the songwriting process. The bold statement of the song – that war is not the answer – proved to be a potent one as What’s Going On peaked at number two on the Billboard Hot 100 back in 1971. Strange Fruit is a white, Jewish school teacher’s response to a photograph of two black men being hung from a tree following a lynching in Marion, Indiana in 1930. Billie Holiday first sang this song to an integrated crowd shortly after it was written. Her heart-wrenching rendition left such an impression on listeners that it quickly became her signature song. Holiday oddly credited herself as the writer of this song in her autobiography, an inaccuracy some have attributed to her prolonged drug use. Written during a crucial time, Public Enemy’s much-heralded album Fear of a Black Planet marked a significant change in Black America. In the title track, Public Enemy create a discourse on attitudes towards integration with hard-hitting statements like: Are you afraid of the mix of Black and White/We’re livin’ in a land where the law say the mixing of race/Makes the blood impure/She’s a woman I’m a man. Performed and recorded by Crosby, Stills, Nash, and Young, Ohio is Neil Young’s reaction to the Kent State shootings of May 4, 1970. Legend has it the band entered Record Plant Studios in LA and finished a live recording of the track as we know it in merely a few tries. Recalling this recording session later, Young noted that David Crosby cried when we finished this take. Written from the perspective of someone observing The Troubles (a term for communal violence in Ireland involving various sects of the Irish and British government), Sunday Bloody Sunday is not just Bono role-playing someone recalling the horrors that exist in civil war, it is also a sobering plea for peace and unity. Medgar Evans, an African American civil rights activist and NACP secretary, was gunned down in front of his Mississippi home by a Ku Klux Klan member hours after JFK’s nationally televised speech in support of civil rights. It was this, in collaboration with a church bombing in Alabama that killed four African American children, that drove Nina Simone to compose this justifiably pissed-off protest song. Biko is inspired by the life and death of South African anti-Apartheid activist Stephen Bantu Biko, who died in police custody at the age of 31. Biko is famous for not only his resolutely nonviolent stance regarding the Apartheid, but is also known as the originator of the slogan Black is Beautiful. Who better than a distinctively British punk rock band to cover the Spanish Civil War? Well, that’s what Joe Strummer and Mick Jones thought when they wrote Spanish Bombs. Referencing Andalucia, Federico Garcia Lorca, and the Guardia Civil, The Clash offer a front-seat history lesson, complete with a chorus sung in Spanish. Oh mi corazon! Springsteen returned from a seven year silence to musically reflect on the September 11 attacks. Introspective and full of metaphor, The Rising is told from the perspectiv of a FDNY firefighter whose oxygen tank is a sixty-pound stone and whose truck bears wheels of fire. Elfoodle, thanks for your positive feedback on the article, I’m glad you enjoyed the list. In reference to Kate Bush, you are absolutely correct about Breathing, The Dreaming, and Pull Out the Pin all being of a political nature. One might even argue that tracks like Room for the Life (from The Kick Inside) or Egypt (from Never Forever) are political in nature. Our Kate is a societally receptive person full of insight. I actually never said that Kate wasn’t an artist unafraid to tackle topics of a political nature, I said she was “never one to fuss with overtly political slogans or sayings.” There is a difference. A track like “Let it Be” by the Beatles has a very direct message, i.e., an overt slogan or saying regarding the state of the world. “Army Dreamers,” however, is, as I say in my write-up of the song, an anti-war message of a more poetic nature, one that goes right for the jugular, much like Pull Out the Pin, with it’s desperate refrain of “I love life, so I pull out the pin” (regarding the Vietnamese soldier confronted with the American soldier). Kate is never too obvious in her messages, nor is she overbearing, like an overt slogan or saying might be. Instead, she weaves a careful narrative, and ultimately presents her listeners with a much more harrowing portrait in the end. That’s why we love Kate so much here at Movmnt. I love the list and the artistic inspiration. However I have to make a correction about your comment of Kate Bush as ‘never one to fuss with overtly political slogans and sayings’. Songs like Breathing – nuclear fallout, The Dreaming – plight of the Aboriginal people, Pull out the Pin – Vietnam war, suggest otherwise taht he always outspoken Bush has never been one to hold back her social critique.